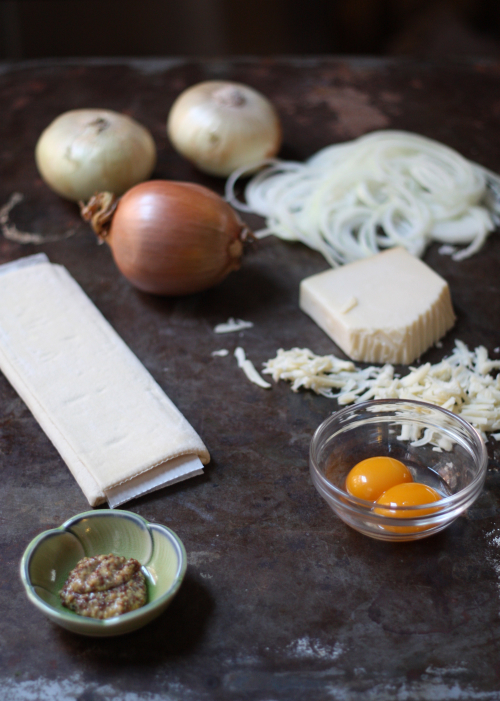 Do you love french onion soup? 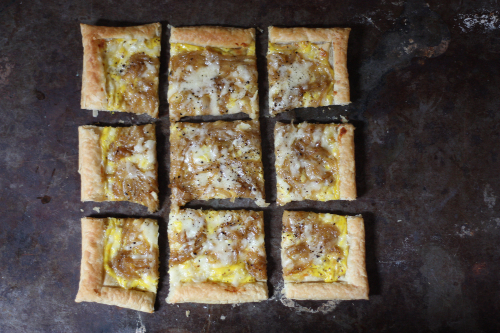 If so, you are going to love this easy to make french onion tart. 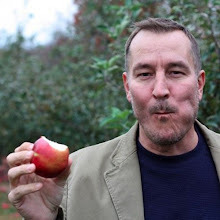 From the first bite, you will swear you just slurped this from a spoon, not bitten into a savory tart! 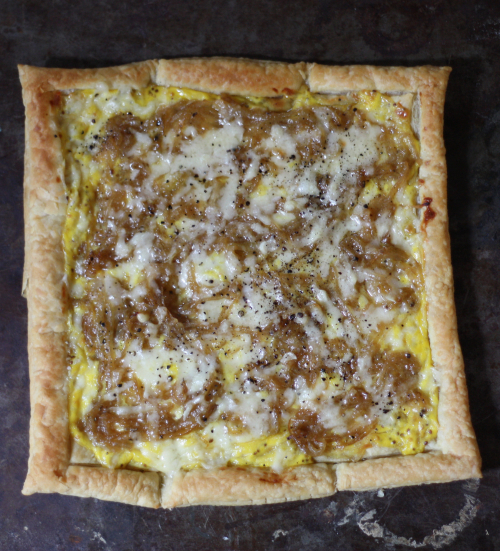 This isn't the first tart featured here on the blog and if the french onion version is not for you, asparagus is also in season and you can make this simple asparagus Gruyère tart. Melt butter in a medium saucepan and add the onions. Cook over medium, stirring frequently until onions begin to turn golden and caramelize. Once golden and caramelized add a cup of the beef broth and deglaze the pan. Continue to simmer until almost all of the liquid is absorbed. Remove from heat, set aside and keep warm. Preheat the oven to 400°. Add the mustard, egg yolks and sour cream in a mixing bowl, blending well and incorporating a 1/4 cup of the Gruyère in. 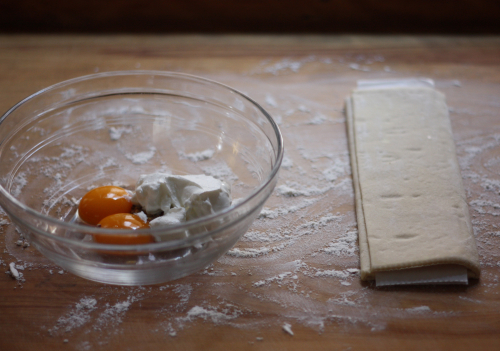 Spread the thawed puffed pastry dough out on a lightly floured work surface. I pulled out my grandmother's bread board. 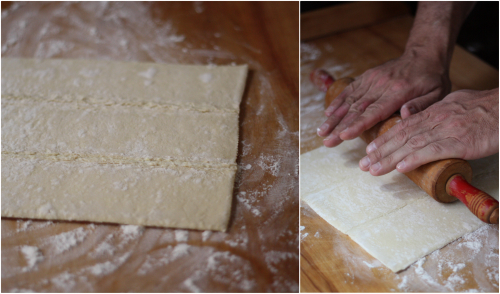 With a floured rolling pin gently roll the dough to thin it out some. You will only gain about a 1/4" to 1/2" in size. 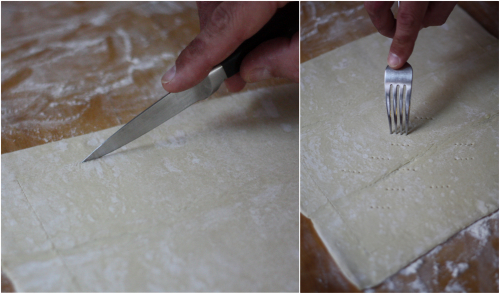 Once done, score the outer edge of the dough about a 1/2" all the way around and prick the center with a fork all over. 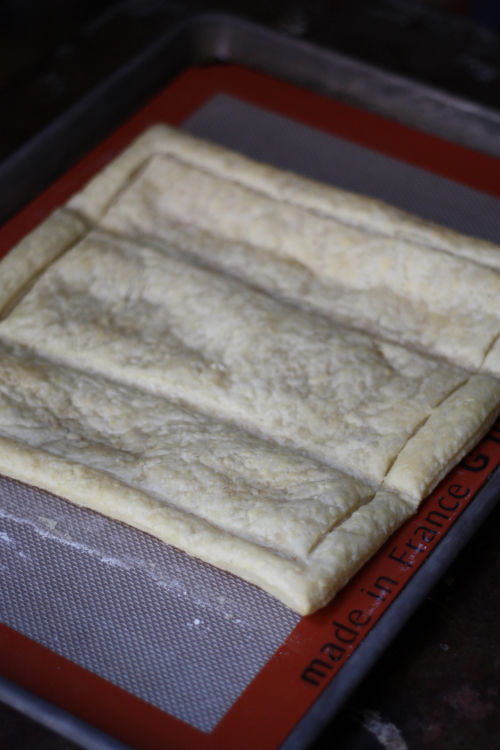 Transfer the dough onto a sheet pan and place in the oven for 15 minutes. 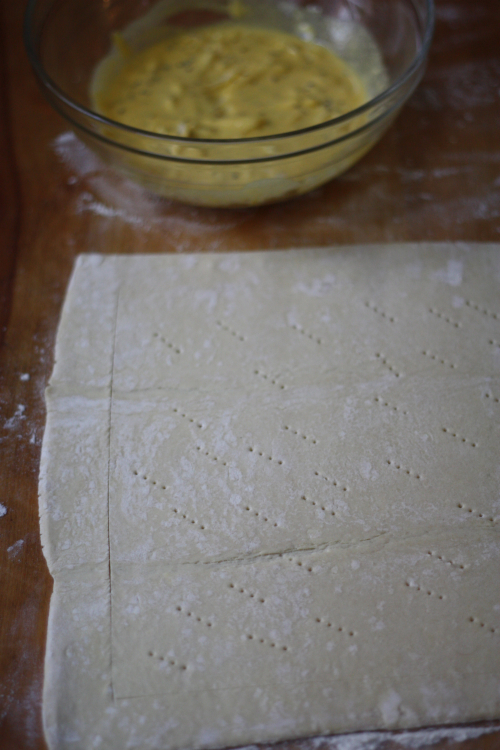 The dough will puff up from the heat but will deflate a bit once removed from the oven. 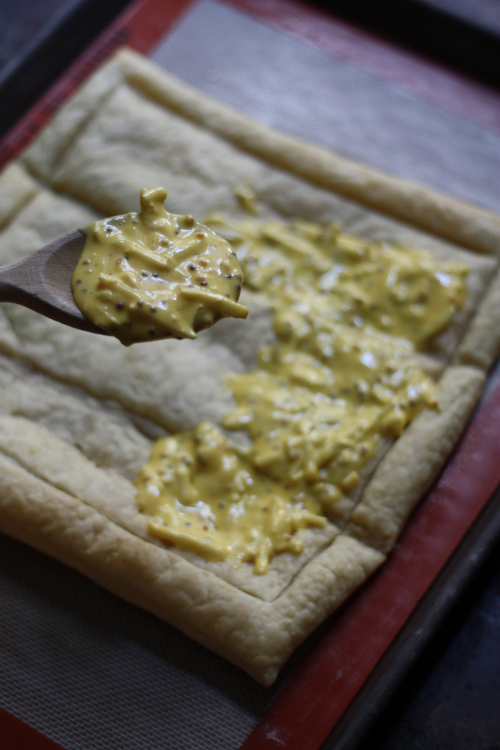 After the 15 minutes, remove and evenly spread a coat of the cheese mixture onto the puff pastry. 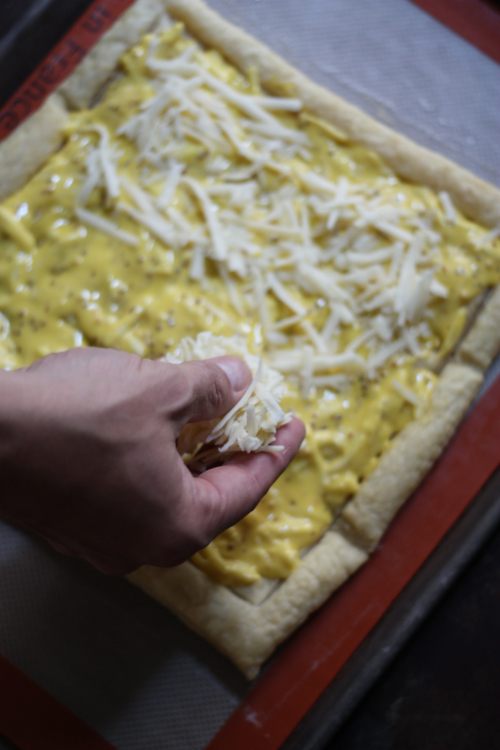 Add a layer of the shredded Gruyère. 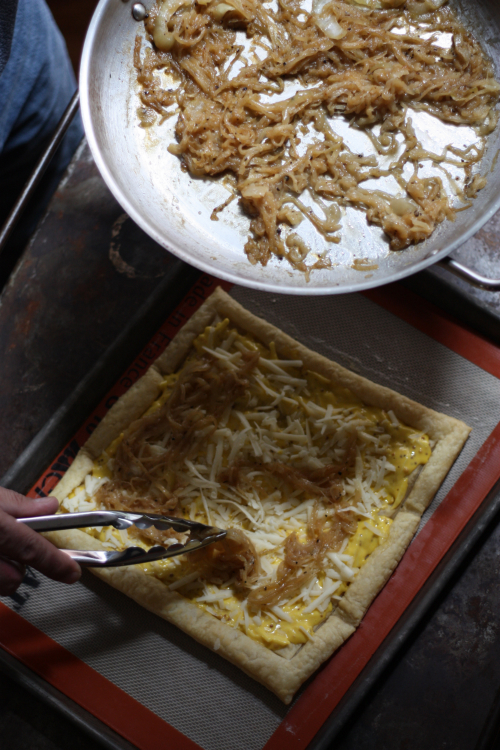 Then spread the reserved onion mixture on top. 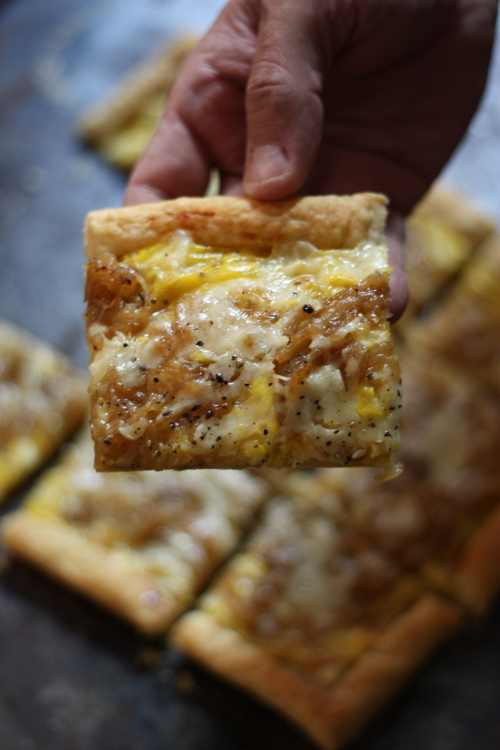 Add any remaining cheese to the top of the onions and return to the oven for about 15 minutes or until the edges of the puff pastry turn golden and the cheese is melted. Remove from the oven, allowing to cool slightly and slice into individual portions. You will swear you are chewing a bowl of French onion soup! Thanks Nancy for taking a look! I will so have to try this - looks wonderful! Thank you and it was delicious! Have bookmarked this, looks yum!